The TideMaster is a small, cost effective Water Level Recorder, specifically designed for applications where the user requires an accurate record of water height, but with the added option of meteorological data via a ultrasonic wind speed and direction sensor. Suitable for use in fresh or salt water, the TideMaster can be deployed for up to 1 year, dependent on the sampling rate, with instrument set up and data retrieval via an optional display panel or using the PC software supplied. 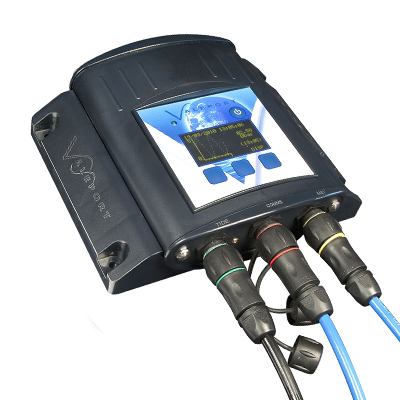 Alternatively, the system can be supplied with radio modules for real time data transmission. The TideMaster tide gauge has been designed to provide an accurate, versatile and easily deployed tide gauge for use in short or long term hydrographic survey operations. Optional OLED control/display panel, Bluetooth and Secure Digital (SD) card memory combined with low power consumption and user selectable sampling regime allow up to a years‟ autonomous operation, whilst optional telemetry packages extend the capabilities for real time operations. TideMaster is compatible with the MIDAS Surveyor GPS Echo Sounder system and a range of hydrographic processing software. Transducer Type: Vented strain gauge, with stainless steel mounting bracket. Range: Standard 10dBar (approx 10m), with 20m cable. Other pressure ranges and cable lengths are available. Calibration: Held within logging unit. Dimensions: 18mm diameter x 80mm. Housing: Injection moulded housing, waterproof to IP67 (1m for 30 minutes), with injection moulded mounting bracket. Display: Optional 128x64 OLED keypad display for configuration and data display. Internal Power: 4 "C" cells within separate sealed compartment. Tool-less battery change. Up to a year of autonomous sampling. Memory: 512 MB SD card memory allowing for effectively unlimited storage. Sampling: Raw data sampled at 8Hz and logged as average over burst. 6 pre-programmed burst modes + custom sampling mode. Switching: Power switch on unit. LED to indicate operation. Resolution: Data logged to 1mm resolution. Weight: 1.1kg (approx) including batteries. The logger is powered by 4 “C” type cells, which, together with the SD memory allows operation for over 1 year of sampling at a 15 minutes cycle with 40 second bursts (with Display and Bluetooth disabled). The TideMaster can be configured using either the optional Control/Display panel or using TideMaster Express (PC software package). Both allow the TideMaster to be configured, calibrated and the recorded data to be extracted and visualised. A variety of telemetry options are available for remote access and delivery of data. Support for Multi-gauge networks is supported in the TideMaster Express software. 0741001 TideMaster portable tide gauge set c/w 1 bar vented titanium transducer; wall mounting bracket and 20m cable; electronics/logger WITH DISPLAY OPTION in rugged injection moulded housing with batteries. Supplied with Windows based TideMaster Express software; switch cap; interface lead to PC, RS232 / USB adaptor, operating manual and system transit case. 0741002 TideMaster portable tide gauge set c/w 1 bar vented titanium transducer; wall mounting bracket and 20m cable; electronics/logger in rugged injection moulded housing with batteries. Supplied with Windows based TideMaster Express software; switch cap; interface lead to PC, RS232 / USB adaptor, operating manual and system transit case. Note: Transducers for deeper operation and with longer cable lengths are available. Delivery on this non standard option will always be a minimum of 5 weeks. 0740011 Radio Transmitter in IP65 housing. Supplied with selectable frequency synthesised UHF radio (458.5 – 458.9MHz), “rubber duck” type antenna and comms lead to Model 740. NB: It is the customer’s responsibility to ensure that the chosen radio frequency is clear and available for use, and that any required fees are paid or licences obtained. Valeport accepts no responsibility or liability for system failure due to radio interference. 0710SA2 Slide Wire Deployment kit for pressure transducer. Includes fixing bracket and 10m stainless steel slide wire. Customer to supply fixing weight.